As a diehard fan of all things Oz, I have anticipated the theatrical release of Legends of Oz: Dorothy’s Return for several years. The film has been in development for almost a decade and faced a series of behind-the-scenes obstacles (delays, rewrites, casting and title changes); the fact that this new animated sequel has triumphed over them may one day become the stuff of which Hollywood Legends are made. In the end, a full team of independent producers and investors, led by brothers Ryan and Roland Carroll, persevered to create a film that set lofty goals, and in the end, surpassed them. Legends of Oz works on virtually every level. The CG animation is glorious, creating visuals of Oz landscape never before seen on screen and the likes of which anyone would wish to visit. Each member of the star-studded cast is provided with scene-stealing moments, thanks to a script that is alternately clever, touching, cute, funny, or inspiring. As a final plus, seven new songs are offered in an “Americana” vibe/mix, from pop to country to Broadway operetta and show tune. They are perfectly suited to the greater, diverse Oz franchise, which has its foundation in the first American fairy tale. All my life, I’ve loved motion pictures as much as I’ve loved Oz, and I’ve spent my lifetime praying for new Oz films. That, however, is a difficult dream to hold. Metro-Goldwyn-Mayer’s The Wizard of Oz, the 1939 classic, is my favorite movie and as near-perfect as any can be. Most attempts at recapturing its magic on the big screen, however – or creating original, filmic Oz sensations – have proven dismal. The Wiz (1978) is cringe-worthy, primarily due to Diana Ross’s sappy, consistently tearful Dorothy. Disney’s Return to Oz (1985) is predominantly dark and joyless, and 1974’s attempt at an animated musical sequel, Journey Back to Oz, was its own train wreck: in production for more than ten years, it lasted but a few days in the few theaters that booked it. Meanwhilst, I’ve learned to acknowledge that it’s no small or enviable mission to embark on a sequel to a film as loved since the late 1960s as has been MGM’s Oz. But I grew up on these films and (as a fan rather than critic) loved them all to the point of holding them sacred. Wisely, in more recent years, both Universal and Disney have followed the prequel road – with, respectively, Broadway’s Wicked and the epic Oz the Great and Powerful. 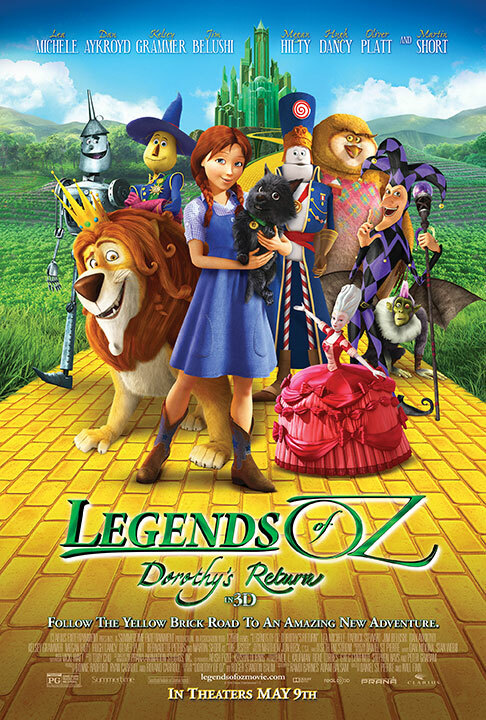 Now a new, independent company, Summertime Entertainment, has manifested a combination of passion and persistence to successfully reach for a sequel “rainbow.” Based on the book Dorothy of Oz, by Roger S. Baum (great-grandson of original Oz creator, L. Frank Baum), Legends is a worthy continuation for several reasons. It’s a good musical. It follows the formula of – and often pays homage to – its MGM predecessor but avoids direct comparisons by being produced in the completely different medium of CG animation. In fact, the latter actually sets up Legends as a competitor of such contemporary animated works as Frozen. That particular parallel is ultimately somewhat unfair; Legends of Oz may boast an impressive $70 million budget, which is top scale for an independent company, but it cannot fairly be compared to the $150 million Disney poured into Frozen. (The latter is now the top-grossing animated motion picture ever made.) Most independent features work with a budget around $30 million or much less. The impressive cost of Legends can largely be credited to Executive Producer Greg Centineo, who, in an unprecedented move, applied his experience in business and finance to the movie biz – building a unique roster of families and non-Hollywood-type investors with a shared passion for Oz itself (like a booming kickstarter campaign – without the online component). As such, Legends must be judged on its own merits. Toby Chu’s score is beautiful, and his melodies open the film with an overture reminiscent of classic theater and cinema productions – similar, as well, to the title sequence in Journey Back to Oz. Fortunately, both music and animation are better this time around. Lea Michele is one of Broadway and TV’s most popular entertainers and well-cast as the voice of Dorothy. Her portrayal is a bit tougher and more assertive than those of some of her predecessors, but the approach works nicely in the present-day landscape of the film, where Aunt Em appears in slacks and we see a faithfully-depicted small Kansas town. For all that the film is somewhat modernized, it retains a welcome and Ozzy timelessness, primarily due to its incorporation of the characters and vistas created by Roger Baum in his story. If inspired by the book, however, the movie also boasts a bountiful originality, allowing the screen adaption to both enhance suspense and dramatically soar above the printed page. The film’s climax is a complete departure from the book yet manages to be equally satisfying. The remainder of the principal cast makes fine contributions. Comic supreme Martin Short is no stranger to voice work, and his Jester is a riot. 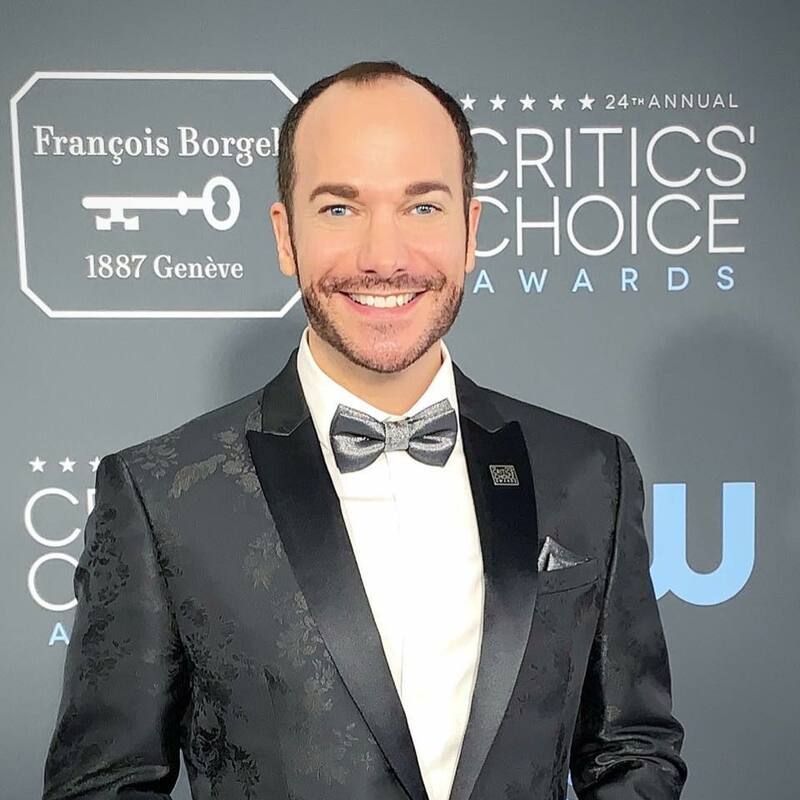 (In an interview on the red carpet at the film’s premiere in Westwood, CA on May 3, Short revealed to me that many of his improvised lines in the prerecording sessions were used in the film.) Chemistry between characters in an animated movie is a very rare commodity, since the actors record their dialogue separately, and the approved takes are then edited together in post-production. Yet Dan Aykroyd, Kelsey Grammer, and Jim Belushi as the Scarecrow, Tin Man, and Lion ooze intra-Oz camaraderie. Their exchanges together are some of best in the film – although even Toto, without any lines whatsoever, also manages to be a scene stealer. Hugh Dancy as Marshal Mallow provides a highlight in a seeming tribute to the modern movie musical as he wins the heart of the China Princess merely by bursting into song. (It’s the same tactic used by Ewan McGregor to woo Nicole Kidman in Moulin Rouge.) As the object of his affection, Megan Hilty manages to be both operatic and sassy as the Princess, echoing her Ozian past as a Glinda replacement in Wicked. While there’s no recurring theme a la “We’re Off to See the Wizard,” or “If I Only Had a Brain,” the songs (written by a total of five composers and lyricists) are very memorable and generously propel the story. “When the World” is arguably the most catchy number in the score. It’s Dorothy’s ballad, heard over a montage of Kansas twister devastation, and while not a belter, (like Michele’s take on “Don’t Rain on My Parade” from the soundtrack of TV’s Glee) it’s a lush showcase of the star’s powerhouse voice. All songs delightfully achieve their intentions; at the aforementioned premiere, the happily partisan audience applauded after the musical numbers as if watching a live performance. “Work with Me” is a show-stopper and thematically highlights one of the film’s best lessons of teamwork. Equally effective in its own way, “Even Then” is a love song and another example of great voice chemistry between the characters of Mallow and the Princess. Hilty’s ability to wail is well-known, but Dancy’s smooth control is a lovely surprise. This is a modern Oz for all generations, a sweeping fantasy film with both a satisfying story and a well-rounded, well-realized entertainment value. As must be apparent, I love Oz movies. I also love the music of Oz, whether heard in the songs of The Wizard of Oz, Wicked, and The Wiz, or the scoring for Return to Oz and Oz the Great and Powerful. One might even conclude that Oz needs to be musical; Frank Baum himself recognized this, successfully adapting his first Oz story for the Broadway stage in 1902. Legends of Oz: Dorothy’s Return marries its message of friendship, teamwork, and love with the everlasting joy of Oz and a few great show tunes. As a result, everybody wins. It may have taken 75 years to get Dorothy back over the rainbow – or in this case, in it (see the movie; you’ll understand!). But it was worth the wait. Sounds great! Cant wait to see it Friday ! The best review ever! So informative and delightful!! Oz continues to charm audiences and bring generations together to enjoy the enchanting tale once more. Ryan Jay, you nailed this review. This movie gives my children a glimpse of OZ and I can totally see my kids getting into the music. And it was entertaining for adults too! I definately want to see this movie again, so much action and entertainment. I saw the movie tonight and couldn’t agree more with your review! Our whole group LOVED Legends of Oz!!! The kids have already asked to go again this weekend!!! I’m so excited this generation will get to grow up loving the old characters of Oz as well as the new characters Legends brought into their lives tonight. This glowing, in-depth review does the movie justice. We feel this movie pays tribute to the original “Wizard of Oz” but because it’s a sequel and is done in CG animation, doesn’t step on its toes. There isn’t a dull moment during the movie and the songs are wonderful….I hear my daughter humming/singing them several times a day. We absolutely love this movie and are going to see it again in 3D tonight. We’re also awaiting arrival of the soundtrack and will definitely be purchasing this movie when it comes out on DVD!! Thanks for the great review, seeing it tonight with 6 year old and 3 year old!